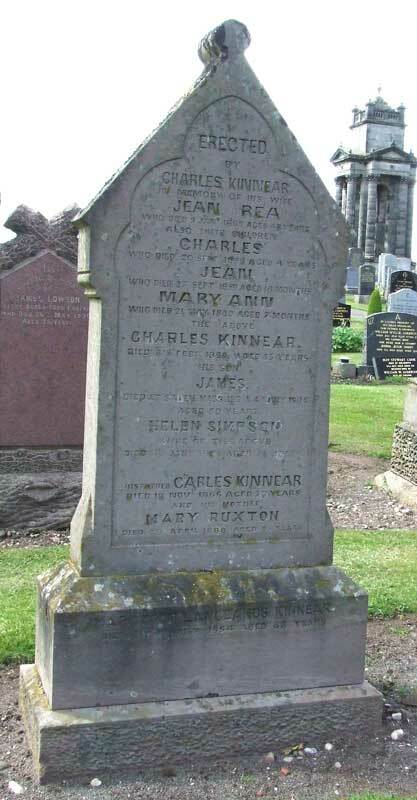 Stone in Forfar Cemetery reads: Erected by Charles Kinnear in memory of his wife Jean Rea who died 9 Jan 1869 aged 43 years, also their children Charles who died 20 Sept 1859 aged 4 years, Jean who died 27 Sept 1859 aged 18 months, Mary Ann who died 21 May 1869 aged 7 months. The above Charles Kinnear died 8th February 1898 aged 65 Years, his son James died at Salam, Mass. U.S.A 4 May 1904 aged 50 years. Helen Simpson wife of the above died 16 Janaury 1908 aged 81 years. His father Charles Kinnear died 19 November 1866 aged 79 years and his mother Mary Ruxton died 9th April 1888 aged 95 years. Margaret Langlands Kinnear died 21st August 1954 aged 88 years. He was the son of Thomas Kinnear and Margaret Hill. (Groom) Marriage*: Charles Kinnear married Mary Ruxton on 13 December 1817 at Kirkden + Rescobie, Forfarshire, Scotland; LDS M112982 + M113172 Jan 2006. (Deceased) Death*: Charles Kinnear died on 19 December 1866 at 20 (Prior) Road, Forfar, Forfarshire, Scotland, at age 78 cert held; Charles Kinnear linen weaver married to Mary Ruxton; 78; Thomas Kinnear farmer (dec) Margaret Hill (dec); disease of the heart, years, disease of liver, years; inf Charles Kinnear son present. [S35] Old Parochial Register of pre-1855 (General Record Office of Scotland) OPR births 1786 Rescobie 317/0010 0264 image held [Mar 2007].